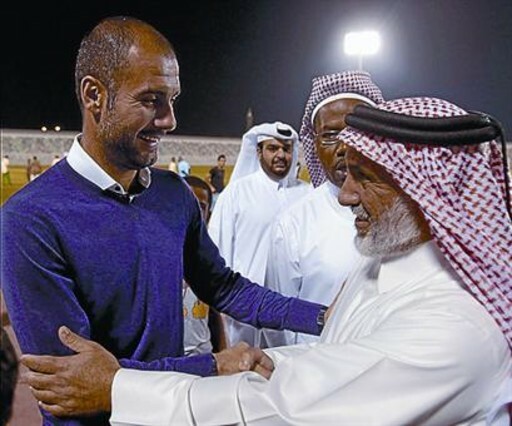 Some months ago we also saw how Guardiola supported the bid of Qatar 2022. As you may know Qatar won the bid but now there are allegations that there was brivery. 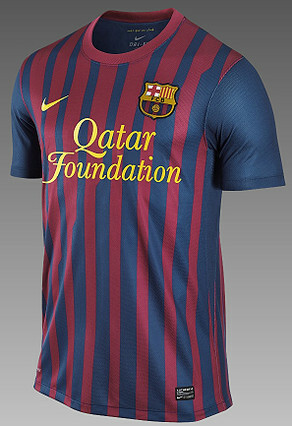 So, I am very unhappy that the new tshirt of FC BARCELONA shows the logo of QATAR FOUNDATION on its front. Barcelona city is a place where the homosexuals we have some rights (WE DO NOT GO TO PRISON!!!) so I find outrageous that the most famous club of this tolerant city wears an ad from a place where homosexuals go to jail, there is not democracy and women have minimum rights. A club that talks and talks about its values and says that is MÉS QUE UN CLUB (more than a club) and at the same time has deals with an homophobic dictatorship seems to me a place with just money money values and no sensitivity at all for sexual minorites (or, currently, miniroties sports too …) I also must say that, as far as I know Barça, a club from Barcelona, does not make any event to fight homophobia. Anybody knows that there is a lot of homophobia in football, so that Barcelona instead of fighting it, it does the opposite: it gets deals with homophobic Qatar! So, today, it was for me a very big surprise to read a news that does not associate Josep Guardiola with homophobic Qatar or with a foundation (Qatar Foundation) who gives awards named after a radical who loves terrorism, wants the extermination of homosexuals and wants the total submission of woman. This time Guardiola name is not in a news related to supporting deals with homophobic dictatorship of Qatar but in visiting a gay friendly democracy named Israel. It seems that he has been invited by Israel singer Noa. I know people in Catalonia who have been very silent when it comes to the fact that Guardiola supports Qatar so much. So now I expect the same: that the fact that he is friend of Noa keeps them silent too. I say that because some months ago Noa came to Barcelona and there was a protest. 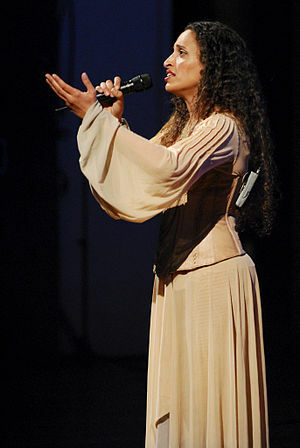 As all the world knows Noa is a singer from Israel very known for trying to bring peace between Palestine people and Israel People. But in Catalonia some accused her to not be strong in condemnation against some atrocities committed some months ago in Gaza Strip by Israel after Hamas sent rockets into Israel land. I have read that Guardiola has wanted a low profile in his visit to Israel. I do not understand why. Is he ashamed of visiting Israel? If he is not ashamed of giving so much support to an emirate that is a dictatorship, where women have few rights and where homosexuals go to jail because they are just homosexuals then I do not understand why he should be ashamed of just visiting Israel? Nobody is asking him to support a Israel Foundation or Israel 2026 World Cup. Nobody is asking him to show for Israel the same support that he has shown for the homophobic dictatorship of Qatar. He is just supposed to be in Israel as a guest of one of the people from Israel that is more known worldwide to try to bring peace beween Palestinians and Israelis. That’s something quite honouring and quite the opposite of what Guardiola has being doing until now by just supporting the wealthy dictatorship of Qatar. I am sure that Guardiola disliked the Spanish dictator called Franco. That dictator also put homosexuals into jail. Barcelona was against that dictator. How come then that the president of Barça and his coach now support a deal between Barça and a dictatorship? Are the dictatorships which are far from Barcelona and that have a lot of money less dictatorships than the ones we had at home? Or is it maybe that the Barça is not anymore MORE THAN A CLUB (MÉS QUE UN CLUB)? Anyway, one thing is for sure, few people in Israel will wear a tshirt from Barça with Qatar Foundation. But he should not worry. Anyone related to Hamas in Gaza strip will be happy to wear it. And any homophobe around the world would be happy to buy it. I received an email some days ago just saying: NO TO HOMOSEXUALITY. ALLAH IS CLEAN. VISCA QATAR! VISCA BARCA! I also want to congratulate Guardiola for having Noa as a friend. Until now I just thought that his only known friends where the rich people from the banks and from the homophobic emirate of Qatar. By the way, I imagine that when Guardiola ends its trip to Israel he won’t go to any Arab country because, if things have not changed, most Arab countries do not accept passports with a stamp from someone who has been in Israel. PEP GUARDIOLA, THE NEW COACH OF QATAR? It seems that Pep Guardiola, the current coach od FC Barcelona could be nthe next coach of Qatar. This should not sound strange as Guadiola has already played in Qatar, has supported the Qatar World Cup 2022 and is keen oon Barça on the sponsoring of the new Barça tshirt by the Qatar Foundation. I have read that people in Qatar consider him as a son. Guardiola says that there are injstices as anywhere else ans he says there is freedom. The fact that Qatar is a dictatorship, that homosexuals are punished with prison or the few rights of women do not seem to have an spaces in Guardiola words about this emirate. I do not understand why Guardiola is so happy with this emirate. The only thing I see in Qatar is money. On the other hand I have read today that a Qatari Investment has bought French football team of Paris, Saint Germain. I also have hear that trade Unions want rights for workers in Qatar from other countries who will help with the construction of new buildings. I imagine that while Guardiola may receive milions of euros to work there most of other migrants there won’t be su unlucky. First of all, let me congratulate current FC BARCELONA for winning the Champions League. I congratulate them for two reasons: One is for winning and the other to win it without still wearing Qatar Foundation on their tshirt. Today I have read that Mohamed bin Hammam has been suspended by FIFA as they study some allegations of brivery. Mohamed bin Hamman is not just related to football but also to Qatar. I say all this because I find that it is not nice that Barça wears an ad from a dictatorship who puts homosexuals in jail and where the rights of woman are not precisely the best. Just for thoses reasons I find that Qatar Foundation in the front of the tshirt is worng but now that I have read that Mohamed bin Hamman, from Qatar, has been suspended by FIFA, I even see the deal between Qatar and Barcelona as a very hard blow. Sometimes I try to see the things in the perspective of an international company like Barça. They have fans from around the world. It is obvious that their attachment with Qatar Foundation bring bring a lot of supporters from the Arab world. On the other hand their gay supporters to lose with this new tshirt are nothing in comparison with the number of new fans from Arab countries to win. I understand that for a business is better milions of new Arab supporters than just three angry gay men from barcelona city annoyed with the deal. But Barcelona headquarters are not in Qatar. They are in Barcelona! So I expect that a team that has its headquarters in barcelona complies with European rules. And I find it is discriminatory to accept a deal which would have never happened was Barceça a lgbt football team. I am horriefied by the support that Barça has in catalonia and in other places. This club who believes to be “MORE THAN A CLUB” does not do anything to fight homophobia! In fact they just do the opposite: They have deals with Qatar. And the worse is that now the shadow about Mohamed bin Hamman can make the new tshirt of FC BARCELONA even uglier.